The term micro CHP refers to a group of technologies that generate both usable heat and electricity. The technology was developed to increase the amount of energy harnessed when burning fuel to generate electricity, thereby increasing the efficiency of the combustion process. The primary benefit of micro CHP (Micro Combined Heat and Power) is that the technology utilises a greater percentage of the energy stored in the fuel than current market offerings (e.g. condensing boilers). Micro CHP boilers available on the domestic market not only create heat for spaces and hot water (much like a conventional boiler on the outside, but very differently on the inside), but also produce electricity for use in your home – it is the heat by-product of the electricity generation process that actually heats your home. A micro-CHP boiler typically uses mains gas or LPG, so they aren’t considered a renewable energy source, however due to their efficiency and productivity, they can significantly lower carbon dioxide emissions and are widely considered to be the future of domestic carbon emission depletion. They may in the future be able to utilise bio-oils, fuel cells or other renewable energy sources, but at present the technologies that are currently ready for market deployment have been developed to use mains natural gas. This technology (check individual models) is eligible for the micro chp Feed in Tariff so you will earn 12.89p/kWh for every kWh you generate, with a further 4.64p/kWh for the electricity you don’t use on site and transmit to the national grid (estimated at 50% of the power you produce). These payments will easily pay for the micro CHP boiler in a short amount of time, in addition to covering any maintenance costs over the lifetime of the unit. Energy efficiency actions and climate change. We here at The Renewable Energy Hub try to keep our information as up-to-date as possible; we pride ourselves on providing you with as much useful information as possible. The tabs on the left will direct you to the information you are looking for. Below, you will find a short outline of some of the sections to help you find the information you are looking for. Micro Combined Heat and Power is a term that refers to a group of technologies that generate both heat and electricity at the same time. Developed to increase the amount of energy harnessed when burning fuel to generate electricity it has been used in the industrial sector since the 1960s but through technological development has been adapted for domestic heat and power needs. Hailed as the future of domestic carbon reduction it’s something we may well all be very familiar with in the not too distant future. This section tells you about its beginnings and charts the technologies development to the current day. There are three basic elements to most combined heat and power technologies: the ‘prime mover’, which is basically the engine that creates the mechanical power, the ‘electric generator‘ and the ‘heat recovery unit‘. From these parts a variety of different technologies have been manufactured and developed. These range from fuel cell mCHP units which generate electricity and heat by extracting energy from fuel at a chemical level, to Stirling engine generators that use standard combustion methods to drive an engine. Learn all about the different types of microCHP engines in this section. How do micro CHP systems work in a home or business? Micro CHP systems have been used successfully in the industrial sector since 1970 but the technology hasn’t been widely applicable for domestic use, largely due to the system’s size, weight, noise and cost. However, due to technological advancement the technology has now been developed for use in our homes and small businesses. These domestic micro chp systems are similar to a domestic boiler in size and weight and in the function of producing heat, the difference being that they produce electricity at the same time. There are currently very few mCHP boilers on the domestic market but there are many more planned for release in the coming months and years. Read more on how Micro CHP systems can benefit you here…. For domestic and small to medium enterprise (SME) applications, the micro CHP unit in your home or business will do much the same as the larger scale CHP models but on a much smaller scale. As previously mentioned, at an industrial scale, a vast amount of energy is wasted, both in its creation at the power plant and in its transference to your home or business (this industrial process can be as low as 30% efficient). It is this on-site, co-generation method that greatly increases the efficiency of the energy production process and thereby lowers the combined carbon footprint and reduces your reliance on expensive ‘dirty’ electricity from the national grid; mCHP domesticboilers claim efficiencies of up to 98%! Read more here…. The factors to consider when working out the economic viability of a micro combined heat and power boiler are many; the FiT / Generation tariff, possible maintenance costs, inflation over the investment period, the usage factors and the units output and the future price of gas and electricity are all to be taken into consideration when thinking about an investment in microCHP. This section will help you decide if a microCHP co-generation boiler is suitable for you. Read more here…. These are typically the largest type of CHP plants. Ranging in scale from a few MWe to the size of a conventional power station, these plants provide high value heat – at the temperatures and pressures often required by industry – along with electricity. In some cases surplus heat can also be used to meet heat requirements of the surrounding local community. Read more here…. Currently available Micro CHP systems can provide a logical replacement for a wall hung boiler and are suited to nearly all homes across the UK. If purchased now, they have the ability to benefit from the micro CHP feed-in tariff and generation tariff for the full ten years allotted by the government. They also produce electricity as well as heat, so they are a more efficient use of the gas you pay for. With this, it can be said that the money you save on energy bills can be seen to cover part or all of the initial investment, giving the units a supposed pay-back period. They will also most likely lower your household’s carbon emissions due to the efficiency of the energy producing process. Some new mCHP boilers that are still in the development stage and not yet in deployment, are boasting up to 92% efficiency, which could save up to 2.6 tonnes of CO2 emissions a year! These pages will describe what this could mean to you. Read more here…. These pages look at how much value a microCHP boiler could be to you. We work out what you can expect from your mCHP boiler and how to optimise its use. Read more here…. Here we provide information on microCHP units that are currently available to the domestic UK market and information on the market’s direction. Read more here…. This section will inform you about what you should expect from your microCHP boiler installer and what you need to know about your appliance. It will also help you to find the right professional for your install. At the bottom of this page we provide a link to our database where you can search for a mCHP installer that can service your area.Read more here…. On this page we inform you about all the accreditations associated with mCHP boilers, their installation and maintenance. With this information you can protect yourself by ensuring your professional is adequately qualified and your products are trustworthy. This is particularly important when working with gas and when looking to benefit from the governments feed-in and generation tariff. Read more here…. Is a micro CHP boiler suitable for my property? Here we look at the suitability of mCHP for your property. There are a few things to take into consideration here, especially if you do not have access to mains gas. Read more here…. 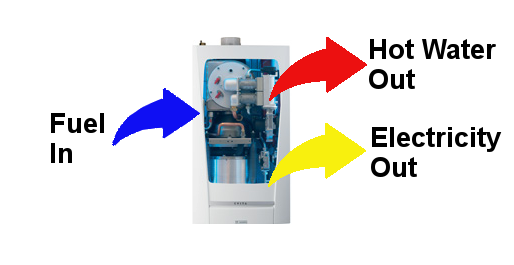 Maintenance demands with a microCHP unit will be very similar to a standard condenser boiler (as the Stirling engine element rarely needs any maintenance at all), but must be carried out by an MCS accredited, Gas Safe installer. Be mindful that additional costs may be incurred as you may need a specialist plumber/technician to examine your particular unit. Read more here…. The future of microCHP is a bright one. Leading companies in the UK’s microCHP sector have set out a bold strategic vision for the role microCHP systems will play in the economy. Many industry professionals feel it is likely to be a key component of an emerging ‘smarter energy’ environment. This emerging group of technologies could revolutionise home heating; this section gives information on the ramifications of this technology’s advancement. Read more here…. In these pages we tell you about the different types of mCHP units that are available, or soon to become available, to the domestic UK market. We aim to update this section as new units hit the market, keeping you up to date and informed so you can choose the right microCHP boiler unit for your home or business. Read more here….